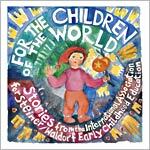 Here is a joyous collection of folktales from around the world, retold from the heart for young children. In addition to some of the best stories the world’s people have to offer, an extra treat is the recipes from many of the cultures that contributed to this rich and wonderful book. Each recipe was clear chosen to be tasty and wholesome for young children, as well as being simple enough to make while tending our little ones. Altogether, this is a vibrant collection that evokes love and wonder. I can’t recommend it highly enough. Where Has Father Sun Gone?